The Hit-Air airbag line of safety apparel is the most important advancement in safety apparel since the introduction of the helmet. PEDCO, LLC is the first national distributor of personal airbag safety apparel in the USA. We introduced the first line of airbag safety apparel in 2004. 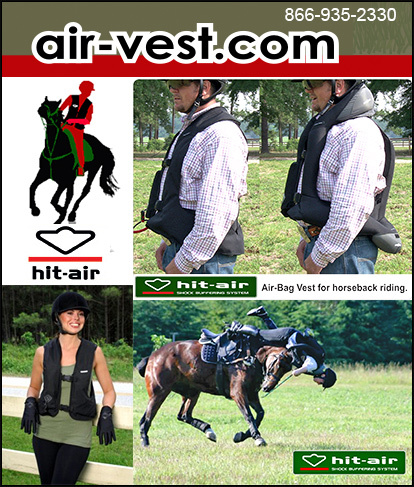 Air-Vest.com was created in 2006 to introduce, educate and inform the equestrian community about this new level of safety protection. PEDCO, LLC was appointed the first national distributor for the Hit-air brand, also in 2006. Mugen Denko, LTD is the manufacturer and inventor of the Hit-Air brand. It is the world oldest maker of personal airbag safety apparel. There are more than 400,000 Hit-Air personal airbag safety apparel sold or in use worldwide. The first airbag safety apparel was introduced in 1999 and has seen significant and continuous improvements over the 14 years since its creation. The inventor and President Mr. Kenji Takeuchi and Rueben Jackson the President of PEDCO, LLC have a passion for the safety of the people who participate in both the equestrian and power sports community. We believe that preventing serious injuries for those who simply want to enjoy life is a noble profession that one may only understand after a serious injury has occurred. Who Needs The Hit-Air Vest? Anyone who rides a horse needs the superior protection of Hit-Air safety apparel. We have received testimonials from people who were doing everything from simple pleasure riding and the horse was spooked and the rider was thrown off, to professional eventers, hunter jumper or barrel racers who were thrown off their horse while practicing or participating in a competitive event. How Does The Hit-Air Vest Work? As soon as the rider is thrown from the horse, a lanyard that is connected from the airbag safety vest to the saddle pulls a key that triggers the CO2 keybox causing the airbag to inflate within milliseconds. The airbag forms a shock buffering protection system that protect the rider's neck, torso front and back, lower sides and hip. Some people are concern of how they will look thinking that they have to wear a “bubble” around them all the time, but the vests are quite stylish and not bulky at all. It is only in the event of a fall that the airbag deploys creating an air cushion around the torso, neck and hip. Is The Hit-Air Vest Comfortable To Wear? What Benefits Does Hit-Air Airbag Vest Offer? The superior protection of the airbag and the fact that it protects the most critical parts of the body more effectively than any other type of non-airbag safety apparel. When the vest is deployed the neck airbag immobilizes the neck in a vertical position to prevent whiplash and other violent movements that can occur during an accident. The torso front and back and the tail bone is also protected by the airbag, the entire inflation takes place with inflation speeds in as little as 0.09 seconds (Advantage™ model) to 0.18 seconds for other harness style models. As a comparison the humming bird wing flap is only slightly faster. Is The Hit-Air Vest Affordable? Yes indeed. But the real question is, can you afford NOT to wear it? Just one trip to the emergency room can cost thousands! The Hit-Air brand of personal airbag safety apparel costs hundreds of dollars less as compared to other brands which pricing goes from $675.00 to $870.00, while the Hit-Air cost goes from $389.00 to $579.00 depending on the model and size. There are some of our harness style models that cost even less than the top brand names of "body protectors" that do not offer a comparable level of protection of the airbag technology, they do not protect the neck and only provide limited protection to vital areas of the body. The average cost of one trip to the emergency room (or worse) would probably pay for one of more of these vests, and the airbag vests are reusable! What Do Customers Say About Hit-Air Vest? I can walk and continue to ride because I was wearing a Hit-Air air vest when my 18.5 hand, six year old Selle Francais gelding spooked, took off for home and inadvertently threw me against a cement fence. The trauma doctors couldn't understand how I took such a severe fall (point of impact was the area of my right kidney) without any broken ribs or even displaced vertebrae! This was the best investment I've ever made in a piece of horse equipment. Everyone who rides should wear these. Thank you very much for sending it to me!! Just to let you know I took the vest this weekend with about 300 people. I was riding my horse at a fast trot and he tripped on a root and fell down and over. I came off the vest went off and I was not in the least bit hurt. It was a great testimonial for the weekend. It will be in the trailblazers newsletter. There are many people interested but I think at times they think about the money. There were a lot of people that should have been wearing one. Praise God for giving me the fortitude to go forward and purchase 2 along with encouraging many others to get one. Where Can I Buy Hit-Air Personal Airbag Vest? The Hit-Air safety Apparel can be purchase online directly from major catalog and retail stores such as Dover Saddlery. You can find a list of our network of fine retailers and online stores at our website in the DEALERS area.You can also ask your local tack shop to contact us to become a dealer, if this is more convenient for you. Don't hestitate to call us today!